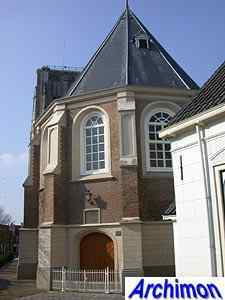 Once Goedereede was an important town, which however only posessed a chapel, the town belonging to the parish of Ouddorp. 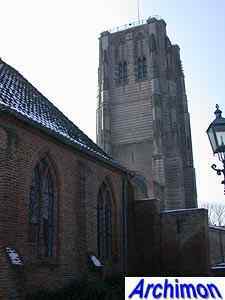 In 1450 Goedereede became a parish of its own. 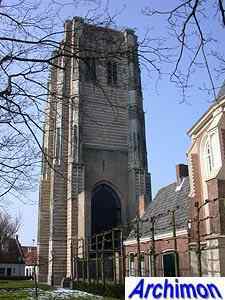 A one-aisled church was built, dedicated to St. Catharina, to which a tower was added later. In ca. 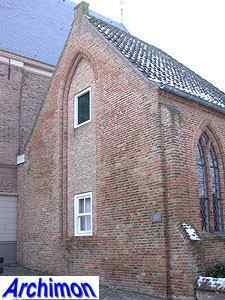 1479 the church was extended with a northern aisle, making the church twice as wide. 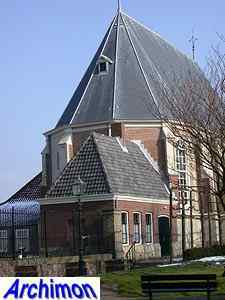 When Goedereedes golden age was over, the church fell into decay. 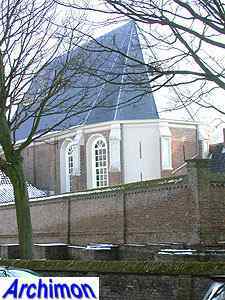 Most of the building was demolished in 1708, and now only the tower, the choir and a chapel remain, although the foundations of the nave were heigtened in 1978 to show the outlines of the church. 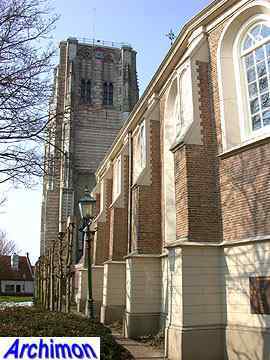 The tower was built between 1466 and 1512. 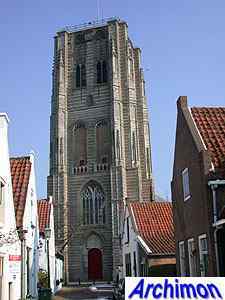 It's an impressive piece of late-Gothic architecture, and shows similarities with the tower in Gorinchem, which was completed in 1517. 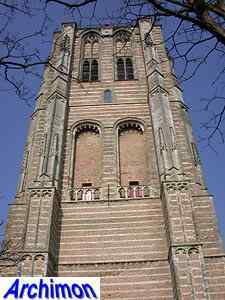 It's mostly built of brick, but has horizontal layers of natural stone for decoration. 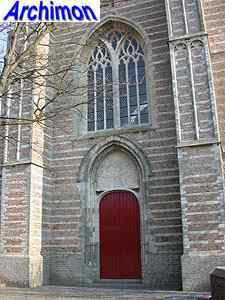 The buttresses are part angular, part diagonally positioned. This is disguised by several pinacles. Most of the other ornaments are gone, of the traceries in the blind niches only fragments are left. 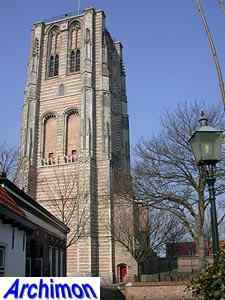 Plans to built an octagonal segment on top of the tower in the late-15th century were not executed. 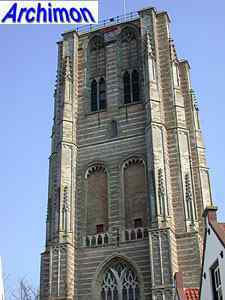 The flat roof made it possible to use the tower as a lighttower, a function it had from 1708 until 1912. 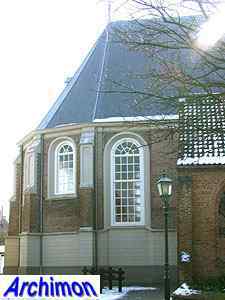 In 1708, after demolition of the nave, the choir was rebuilt into the small current church. 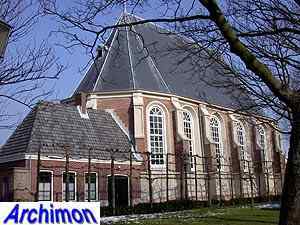 The walls were lowered, the west side was closed and the whole building was given a new look in Classical style. 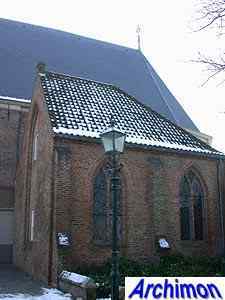 The small chapel on its north side is still in Gothic style.